Great posts as usual, Eduardo! Thanks for the enjoyable reads/looks! I looked at the most recent PTS list Eduardo posted. I really like aqua blue metallic which is no longer offered under the standard colors. It has a ? on the PTS list. Was there a problem with that color which led to it no longer being offered? If no, any idea how likely it will eventually be a PTS offering? Was there a problem with that color which led to it no longer being offered? If no, any idea how likely it will eventually be a PTS offering? No, I don't think there was a problem (e.g. fading, etc) with 'Aqua Blue Metallic'. Porsche changes some of its color offerings - the only regulars that haven't change in a long time are 'Black' and 'Guards Red'. I had 'Aqua Blue' on my Spyder and it is a terrific color! But it was removed to make way for the new 'Sapphire Blue Metallic'! I looked at the most recent PTS list Eduardo posted. I really like aqua blue metallic which is no longer offered under the standard colors. It has a ? on the PTS list. The ? means that it has not been yet requested as a PTS for a 991 or 981. Thus the 'feasibility test' is necessary to determine if it passes the fade test, etc. The ? also tells you that as of the date this PTS list was issued by PAG, no feasibility test had even been started for this color for that particular model! However, on the positive side of the ledger, 'Aqua Blue Metallic' was requested and approved as a PTS color for a Panamera! That tells you that 'Aqua Blue Metallic' will probably not be an issue as a PTS for the 991 or 981, given the similarity of the materials (metal, plastic, etc) used on the Panamera! Mike: Go ahead & order a PTS 'Aqua Blue Metallic' 981. You will most likely get it approved! The next PTS window apparently will start in June for MY2015. I have always liked the deep greens like British Racing Green and the Porsche Racing Green that was offered on the Boxster a few years back. 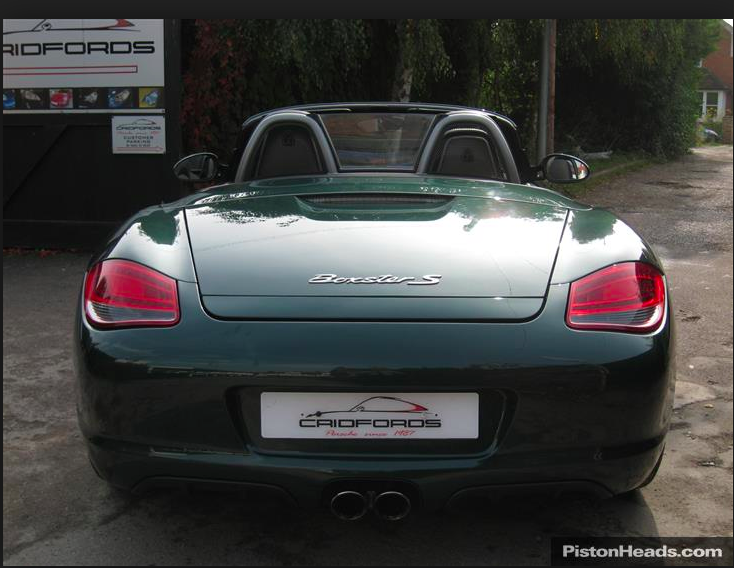 I saw one PTS 981 Boxster in Brit Racing Green, I think from Sonnen Porsche a while back, and really liked it. I think these greens go very well with the brown toned leathers. Does anyone know if either of these greens will be offered in the near future? I have always liked the deep greens like British Racing Green and the Porsche Racing Green that was offered on the Boxster a few years back. I saw one PTS 981 Boxster in Brit Racing Green, I think from Sonnen Porsche a while back, and really liked it...Does anyone know if either of these greens will be offered in the near future? If one was to order a 981 in a PTS color is there a designated time in the calendar year to do this or can you do at any time. The green in that 2nd photo really POPS ! Designated time window. Eduardo mentioned above that MY2015 PTS will "apparently" start in June. Fantastic pics and colors in this thread. BTW, did I mention I love Aqua Blue Metallic? Yes - only in designated times when PTS 'window' is open for such type of ordering. Varies from year to year to year & model. For 981 Boxster & 991 in model year MY2014, it was closed in late December, 2013! It's scheduled to open again for those two models in June for MY2015. For MY2013 / 2014 981 Cayman, it has yet to open. Period. End of sentence. Your dealer gets the notice from PCNA, so that is how you best keep informed. Camera lenses can do wonders - and often misrepresent vs what your human eye see. Never base your PTS decision on photos you have seen on the internet. Your eye has to see it in person! 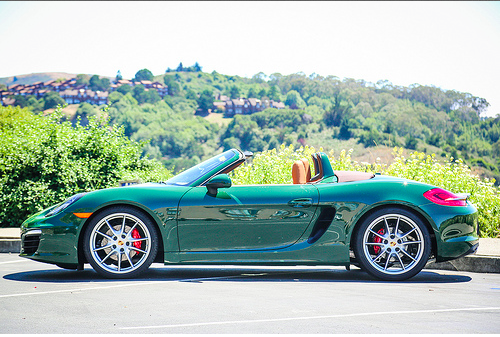 What color do you think is the one on the attached official dealer photo of a PTS Boxster they recently had for sale? Will the true & genuine BRG please stand up! Last edited by Z356; 03-09-2014 at 11:36 AM. If we are voting for greens, I would love to see Malachite return. It was a special coLor in '09 - is that correct, Eduardo? Dark olive metallic looks interesting also (and I think it's approved), but I have never seen it on a car in real life. I believe 'Malachite Green Metallic' was a special color starting MY2008. 'Dark Olive Metallic' even earlier (e.g. MY2005). Both are currently available PTS. By the way, I personally love 'Green' but it's NOT appreciated much by US Porsche dealers nor many of their US customers! If standard/special color offerings was left to US dealers to decide, they would probably ban 'hard-to-sell-green' Porsches altogether! Germans, on the other hand, ordered cars in a green hue much more often...thus the reason at least one 'green' or two appears so regularly as a Porsche color selection in their offerings! 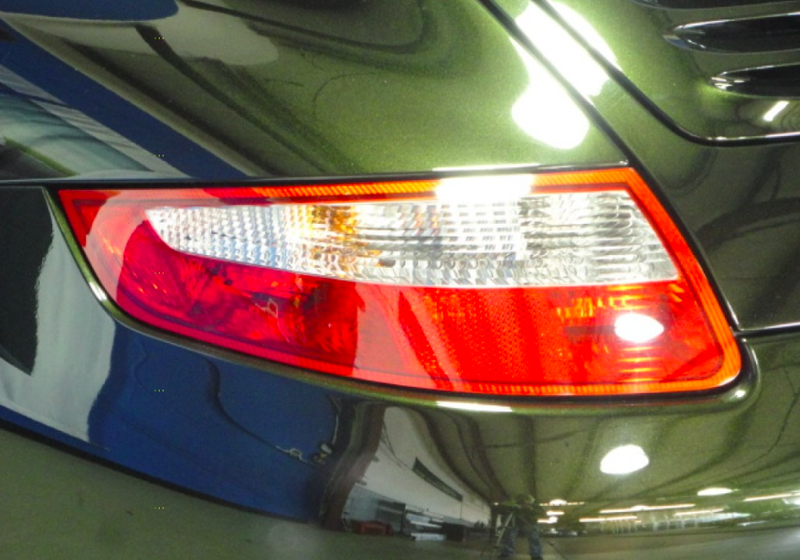 Dark metallic greens, in particular, were Ferry Porsche's favorite colors on a Porsche! And Wolfgang has a taste for green Porsches too! PS: See attached photo of 'Dark Olive Metallic' 997. 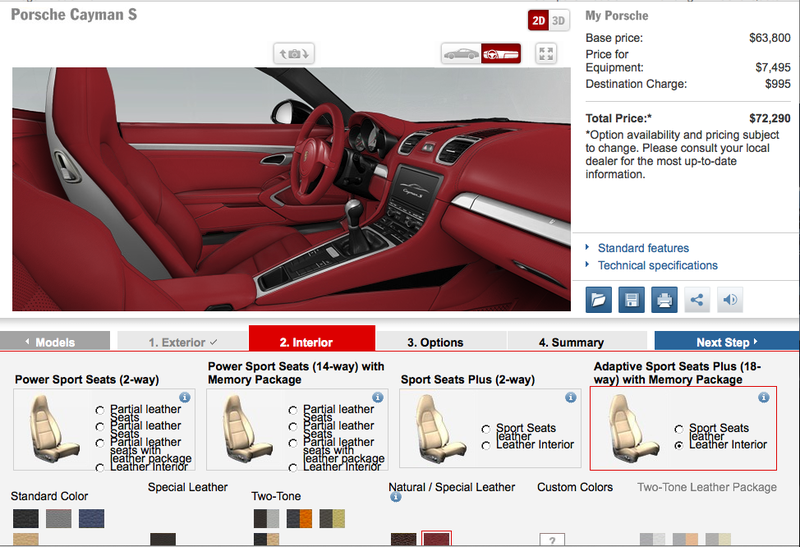 As Maxpowers alerted us in Forum a few hours ago, PCNA's configurator showing some key changes today. Not clear yet if for MY2015 Only or if includes balance of MY2014 production! 1) 'Carrera Red' Leather interior replaced by totally new 'Garnet Red' as one of two choices in Special/Natural Leathers. 'Black/Garnet Red' is now offered as an additional 'Two Tone' offering in the 991...but not the 981! 2) New Metallic Paints offering: 'Jet Black Metallic' (instead of 'Basalt Black') and 'Carrara White Metallic'. 3) Additional Special Color 'Carmine Red' added to 'GT Silver' and 'Lime Gold Metallic'. All three are $2,580 extra. 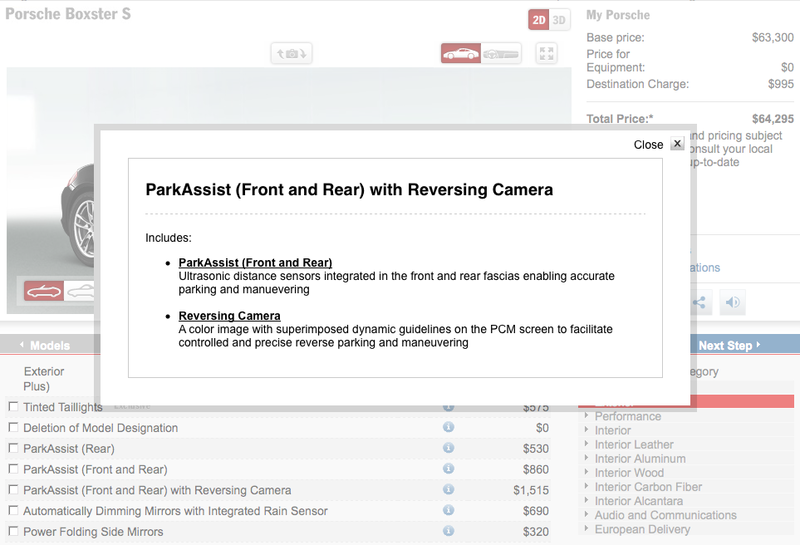 Hope others can add what ever other changes they have noticed in the PCNA configurator! 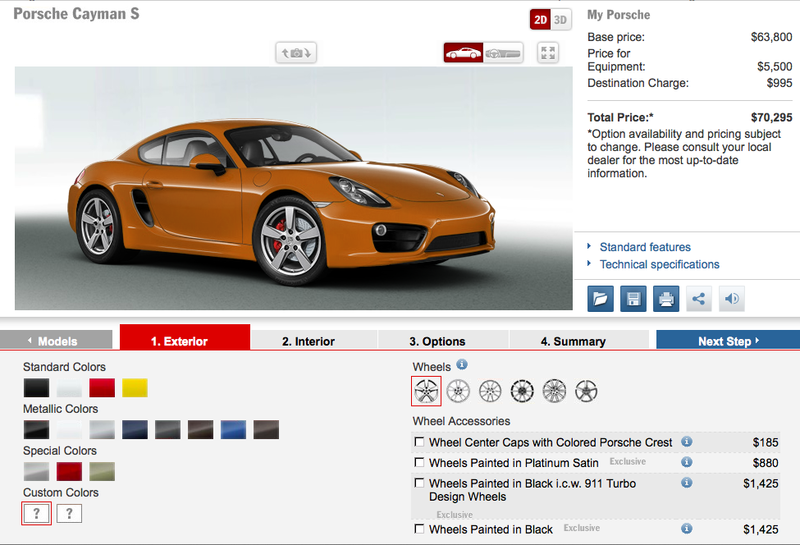 PTS for the MY2015 Cayman? We need official confirmation of this change...great news if true! 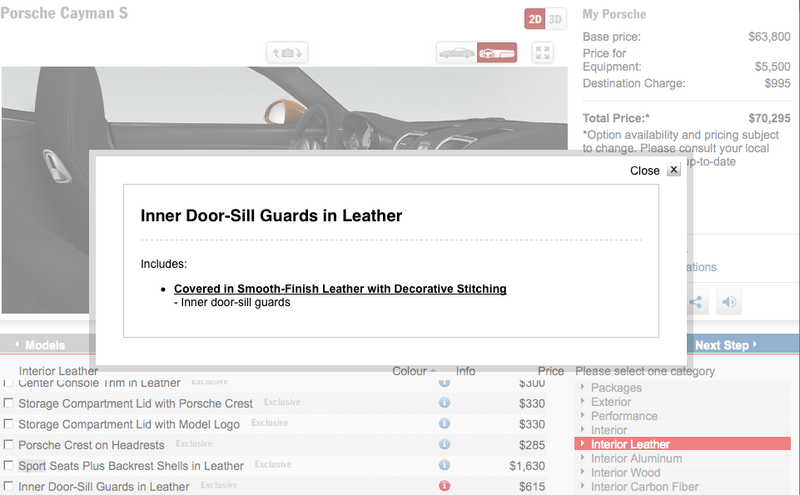 Leather interior door sills are now available on both the 981 & 991 models. anyone know why you can't order interior package painted (option code EER) with a PTS exterior?